The Perils of Online Dating, Popeye and Pirates. Marigold, staring into open fridge, frowning. Scary how I guessed that, but after many years exposure to the bizarre workings of Marigold’s mind, maybe not so surprising. Just Googled ‘Gormenghast’ to check I had spelt it right (yes, I had, obviously) and shocked to see the first volume of the trilogy, and the best, was first published in 1946. I first read the book in my early teens so it wasn’t even ‘new’ back then. To put it in perspective, the ‘Handmaid’s Tale’ was published in 1985. That's almost new then! We were in a bookshop this morning and I noted a display of books with dogs on the cover, about twenty or so, and a single book with a cat looking up at a Christmas tree on its cover. 'Easy to spot the odd one out here,' I remarked in passing. Marigold studied the collection for rather longer than anticipated before pointing to the solitary cat amongst a virtual forest of dogs. I stopped dead and returned to look at the display. 'It's the only one with a cat on the cover. Every other cover has a dog on it,' I said. There are times when the way Marigold perceives the world is demonstrably different to everyone else. 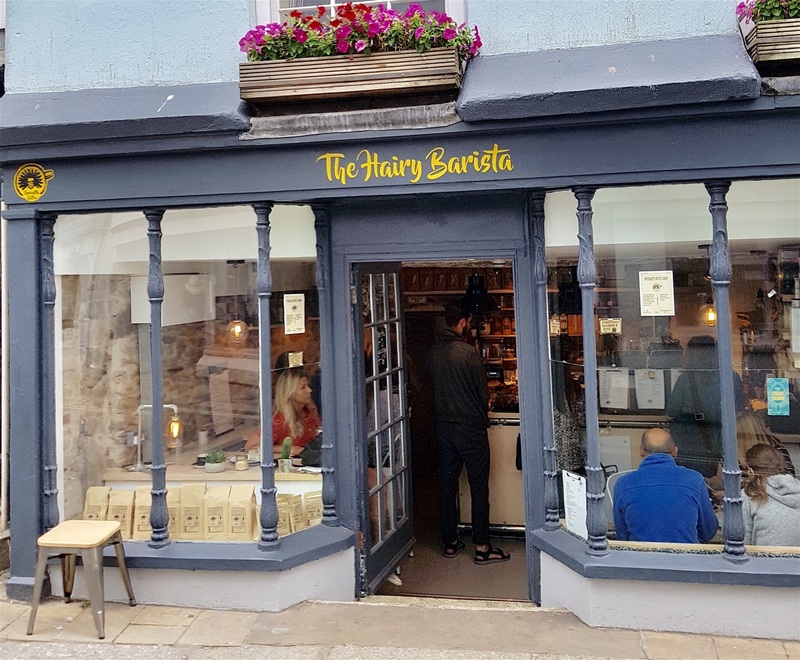 Out and about in Salcombe recently – very crowded, nowhere to park – we rested our weary bones on a pavement café style pub. The tables were crammed and very close together. Marigold nudged me. ‘Listen,’ she said. Well, ordered really. Two women of a certain age next to us were discussing the experiences one of them was having on an online dating site. Back to the next table. She looked astonished as her friend roared with laughter, a wild demonic cackle leaving her puffing and wheezing like a steam train departing the station. 'Yeah, that'll be it, him having the builders in so he's dossing down in a B and B instead of a mansion,' she finally managed to say. A friend emailed us yesterday with sad news. 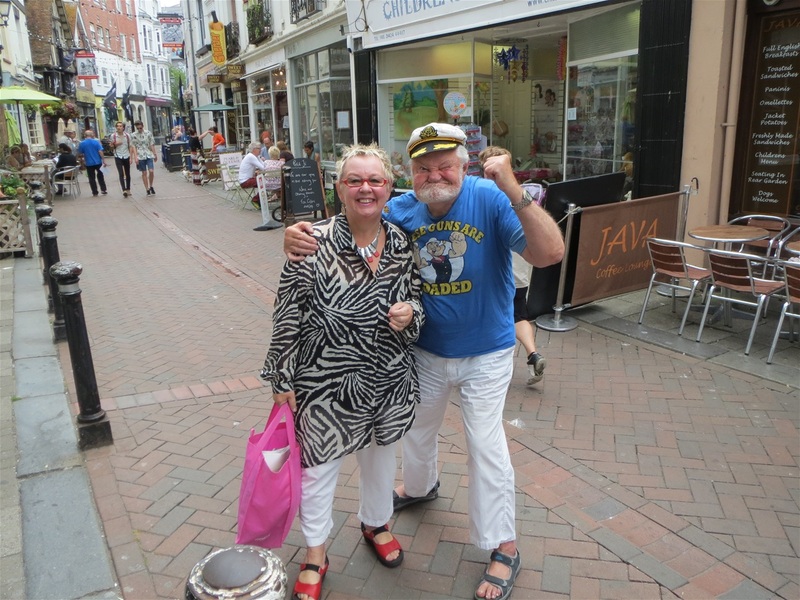 Ron Everett, one of those ‘characters’ that makes Hastings Old Town such a joy to wander around, has died. Ron habitually dressed as Popeye and must have been the subject of thousands of photos. 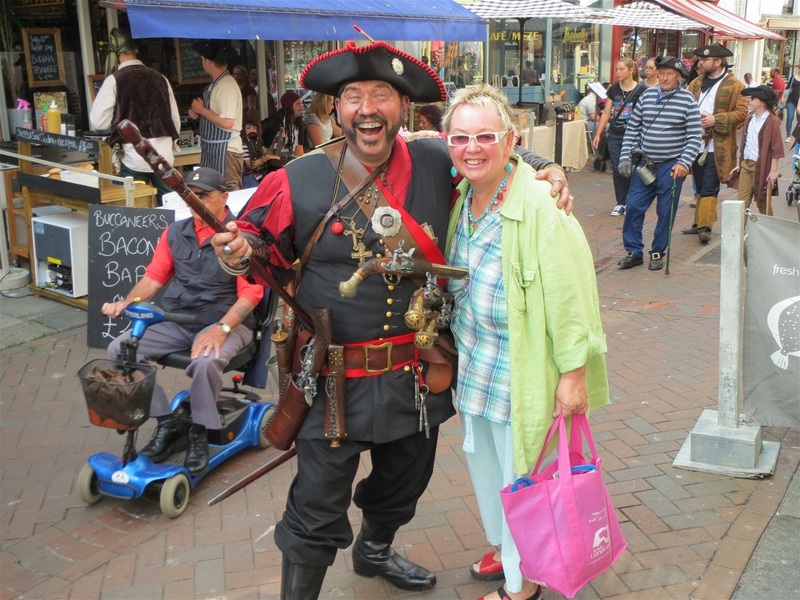 He was 86, but had been out and about at Pirates Day only a couple of days ago. 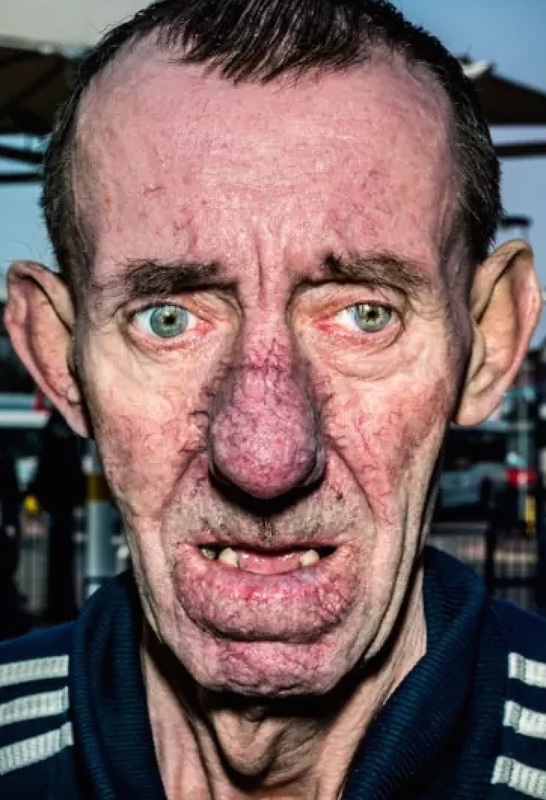 The former sailor travelled all over Europe including France, Belgium and Portugal to take part in carnivals and Popeye’ will be sadly missed. This has been the first Pirates Day we have missed in a while, even though neither of us makes much of an effort as regards the actual dressing up. Plenty of others do though. 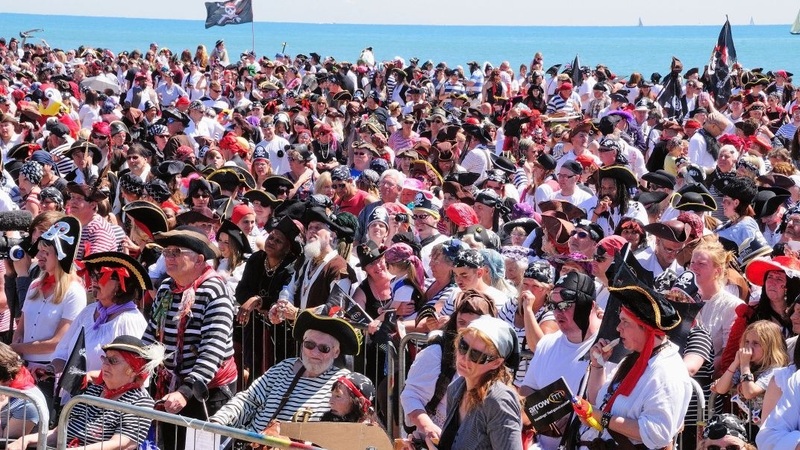 Hastings holds the World Record for ‘most people dressed as pirates in a single place’ – yes, there is such a category – awarded for the crowd gathered on Pelham Beach, Hastings in 2012. Official count was 14,231. I looked up the figures, dates, etc, but there are plenty of people in Hastings Old Town who have these facts at their fingertips. Ron Everett was one of them. 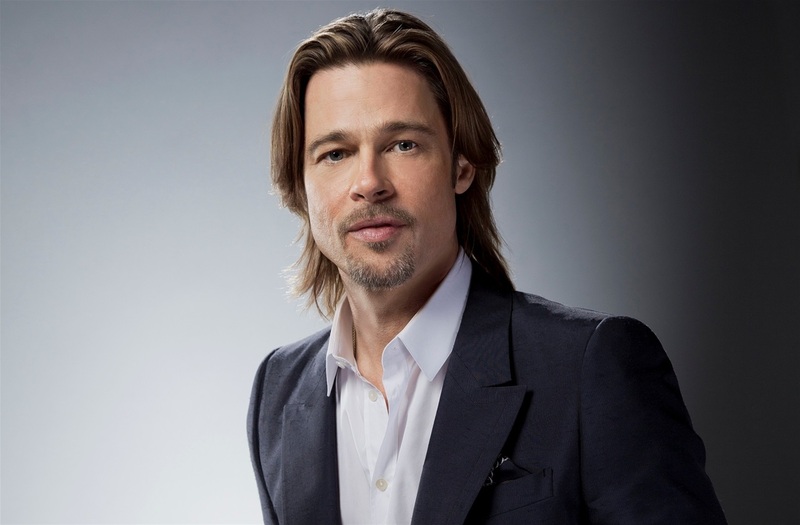 He wasn’t the only notable figure around the place. There’s a man with a full beard who wears flouncy dresses, a man who walks around dressed as a wolf and any number of strange characters in the Old Town. As with every other place we’ve lived for any significant time, many happy memories and no regrets. There’s a keen rivalry between Hastings and Penzance (of Pirates of Penzance fame) as Penzance held the previous record. An attempt in 2014 to regain the record failed by just a small number, but the revelations that the local council spent £55,000 on this unsuccessful attempt still rumble on. 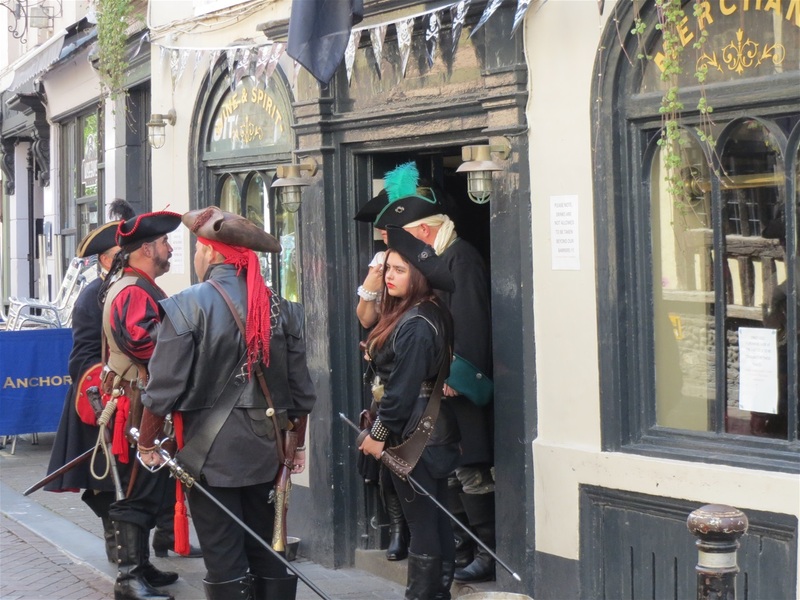 I see there’s a Pirates Day planned for the Albert Dock in Liverpool in September and several others around the country, even Matlock Bath. Johnny Depp as Jack Sparrow and those dire films (only my opinion, so not necessarily fact) have a lot to answer for. 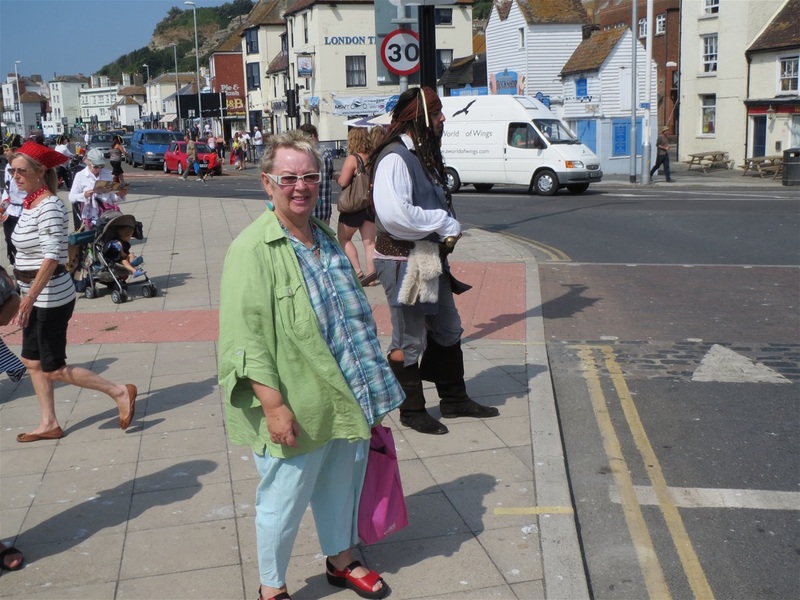 We were in Brixham a couple of years ago, thinking about buying a house there, and the whole town was Piratical. No world record attempt on pirate numbers, but seeing the longest conga by people dressed as pirates attempt was impressive. No idea whether that’s an official record. The Golden Hind is moored in Brixham harbour and a pitched battle involving pirates, muskets and lots of noise was great fun. We’re not great fans of fancy dress, but even miseries like us had a great time. Popeye and Marigold. He's the one with the cap on. No idea of the collective noun for a group of Pirates. A bandana of Pirates judging by this photo. Marigold with a friendly pirate. 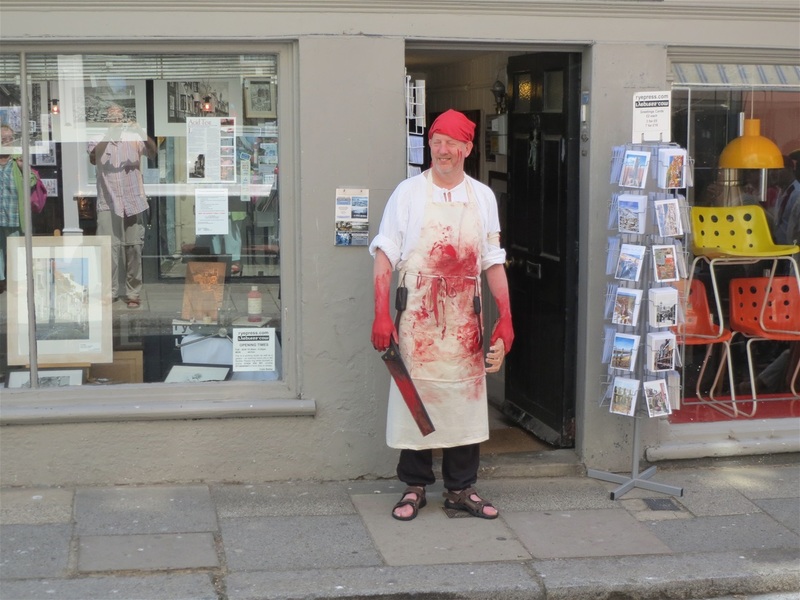 We see this bloke dressed up as something different most weekends. Can't remember why I took this photo. Must be the pirate style top. Yeah, that'll be it. He's a very nice man, usually. Just not on Pirates Day. Marigold's expression suggests she's had enough of Pirates Day for now. Cafe in Totnes. 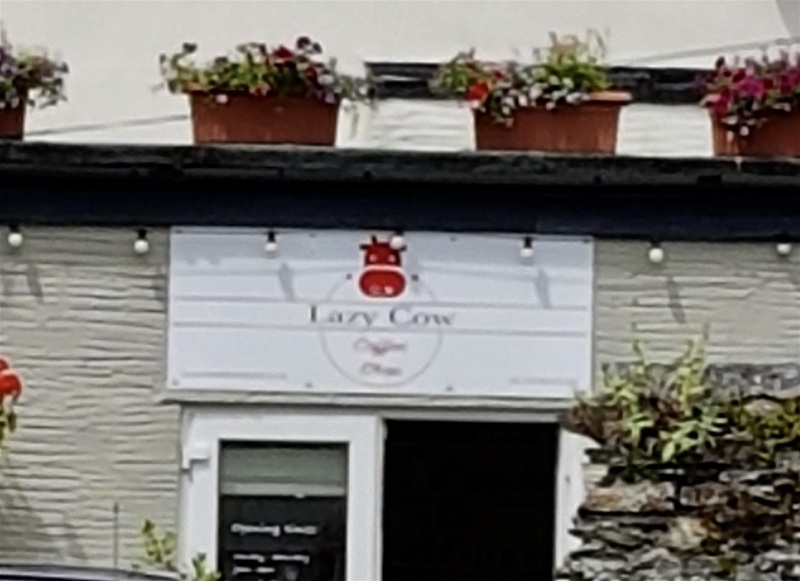 The name of the shop reflects the nature of the owner. Not sure whether this one does too. Hope not.